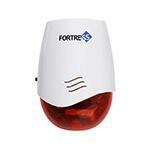 The Fortress Motion Detector uses Passive Infrared technology to detect motion. These sensors can pickup motion up to 25 feet from the device. With a viewing angle of 110 degrees horizontally and 90 degrees vertically you can be assured that these sensors will detect any intruders. Communication back to the main panel can be from up to 150 feet away depending on obstructions. With built in switches to control time between triggering events, and the LED that flashes to indicate detection of motion, conserving battery power has never been easier. 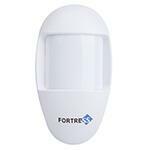 Fortress Motion Detectors use 2 AA batteries. 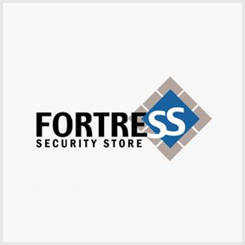 The Fortress Door/Window Sensor is the front line of defense for your home, business or RV. 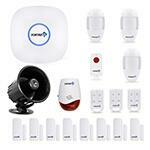 These sensors are designed to detect a door or window being opened. 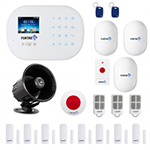 When used with the systems Ready to Arm feature, these sensors will notify the panel if they are not closed. The panel will then let you know to close the door before arming will be possible. 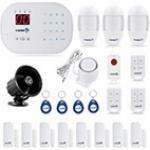 We recommend a Contact sensor for every door and window on the ground level to ensure that any entry is detected as soon as possible. 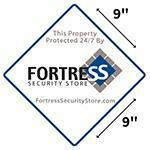 Dimensions: 2.625" x 0.5" x 1.5"
The Fortress Glass break sensor is a dual function sensor. Not only does it detect the sound of breaking glass, when installed directly on a window it will also detect the vibration of a strike that is not sufficient to break the glass. These sensors plug into AC power for their primary source and cover a 50sq foot area. (5 feet in every direction). 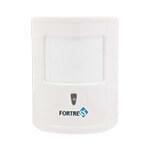 The Fortress Plug In Strobe Siren has adjustable volume levels, a backup battery and an On/Off Switch to allow for easy transportation to a new location without the possibility of triggering a false alarm. This siren plugs directly into a wall outlet for its primary source of power. 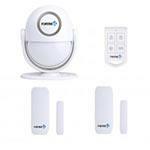 Its small unobtrusive design makes it a surprise to any burglars that try and get into your home. 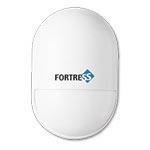 The Fortress Water Sensor is designed to protect you in case of flooding, which could damage your building. If water reaches the level of the sensor, it will immediately send a message to the control panel, which will notify you via SMS or phone, depending on how you choose to configure the system. Dimensions: 4.25" x 1.25" x 6.125"
Dimensions:4" x 4" x 4""